Discussion in 'Astronomy, Exobiology, & Cosmology' started by paddoboy, Nov 21, 2017. I tip that along with the momentous findings/discoveries of COBE, WMAP, aLIGO and associated gravitational wave detectors, GP-B, the LHC and other particle accelerators, the HST, and the ISS, that the JWST will prove invaluable and revealing in new discoveries, data and knowledge. well worth every penny spent to get it into operational mode and orbit. The next big cosmological break though , is the includence of Cosmic Plasmas in the cosmological Universe theory . Well since most of the experiments I outlined have gone to further strengthen the BB and GR, and since the Plasma and/or Electric model was debunked and refuted 30 or so years ago, and since the BB already encompasses Cosmic Plasmas, I see your chances of that being true as between slim and highly unlikely. By the way, this thread is about the promotion of the next big science experiment, [JWST] not for you to push discarded alternative hypotheticals. 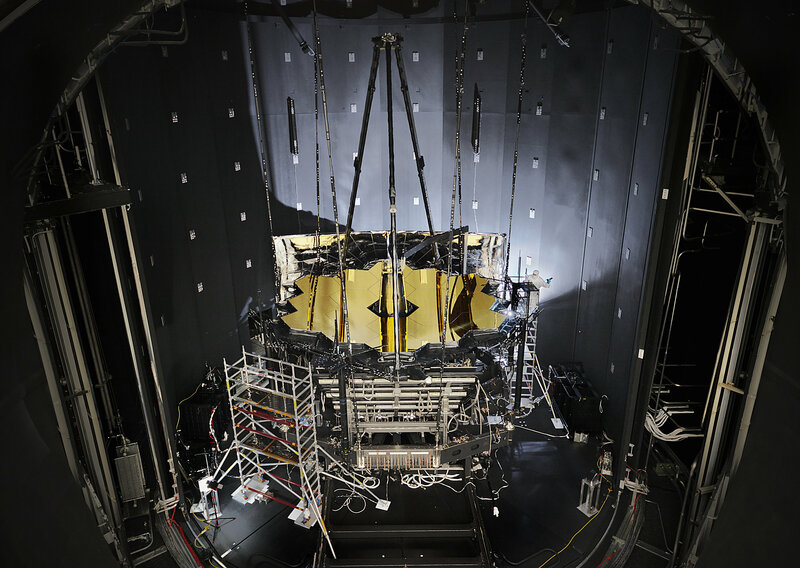 Can anyone summarise what this James Webb telescope is intended to achieve? Right, so it is a near and mid IR telescope and spectrometer. I presume it is said to be able to see through dust on the basis that Rayleigh scattering goes up with the 4th power of frequency, so in the IR there is very little. Espresso might also reveal some earth like planets. 2018 will see some lunar toerism altough it's in elon time. ( he will get their late but fasther than anyone really expected) It might lead to funding for "bigelow" and a space hotel that would provide regular flights and therfore cheaper rockets. we will probably see a driverless truck delivering a payed payload somewhere. The more funding for space exploration the better...otherwise I havn't a clue what you are on about. espresso is basically a (earthbased) telescope upgrade that can detect earth like planets (in time) I think it's interesting. The james webb telescope is certainly spectacular but isn't the only high valued mission for the near future. The more the merrier I say...There's plenty of money being wasted elsewhere that would do better going into all forms of space exploration and research. we need a economy something to make money and fancly something to spend less money. I think the basic concept of the space shuttle was a good id (reusable) but sometinh space x does far better. Getting into space cheaply is important. And having a economial purpose there is swell. The moon and low earth orbit gives us the possibility for tourisme. Mars can't deliver on this front. Whilst space x performs well in getting mass cheaper to orbit that anyone else, you simply can't bead the moon, it's as simple as a 11 km/s with a atmosphere and 2,38k and no atmosphere. Even usain bolt against a cheetah doesn't compare on the advantage. The moon is low on volatiles like water that said it's a lifeless chunk of rock their is little danger of having a comet impact in one of the polar shades with enough water to fuel a space economy for several centuries. Global warming is probably going to happen no matter what we do (that doesn't mean we should do anything) there will be a market for solar shades. Bringing that much mass into orbit is simply cheaper from the moon. Elon musk ones said that orbital power station are a no go even tough they receive power 24/7 efficiencies in beaming the power towards earth make it non economical even if you neglect the launch costs. But if you could install reflectors either in space or on the moon that beam extra light and energy towards the financial scale might tip in favor of space. To strenghten BB and GR , not surprised . You know to keep you in the dark about what is really going on out there . Cosmic Plasma and Electric Universe theory has not been bebunked , and is actually gaining recognition . It probably has not been debunked because it is not a complete theory. Again posting this in the science section is not good. Honestly at the moment many are involved in the question of getting rid of the fringe and I suggest that is brought about by posting non mainstream in mainstream. I have read such and such in the maths section, science whatever and I present my thoughts ...then have your say against the main stream bit you reject. I don't want to see you banned for one nor do I want, what I would see as an overreaction, of the site getting rid of the fringe. I expect you like this place and what I suggest I think would be helpful. Alex your being nasty . You are trying to be subliminal . I am sorry you interpret my attempt to help both you and the site as nasty and ask that you give further thought to what I said. I reject your observation and would encourage you not to be so negative. If you want to insult me that's OK but you will find that perhaps your attempts will backfire on you. Absolutely uncalled for and unnecessary. If you are going to post fringe type subjects, please stick to the Fringe sub-forum and stop infecting the science forums with them. Prophetic words, O Bearded One!